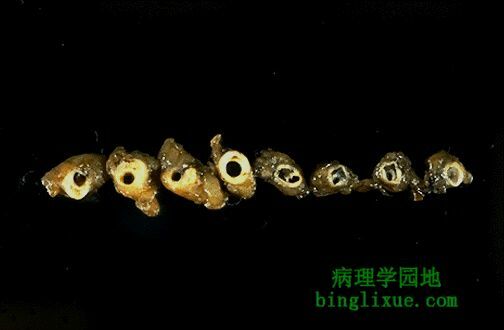 A coronary artery has been opened longitudinally. The coronary extends from left to right across the middle of the picture and is surrounded by epicardial fat. Increased epicardial fat correlates with increasing total body fat. There is a lot of fat here, suggesting one risk factor for atherosclerosis. This coronary shows only mild atherosclerosis, with only an occasional yellow-tan lipid plaque and no narrowing. 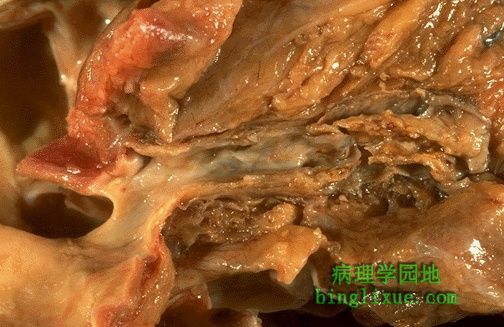 This is coronary atherosclerosis with the complication of hemorrhage into atheromatous plaque, seen here in the center of the photograph. 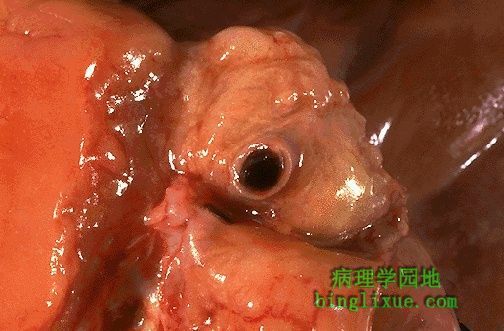 Such hemorrhage acutely may narrow the arterial lumen. 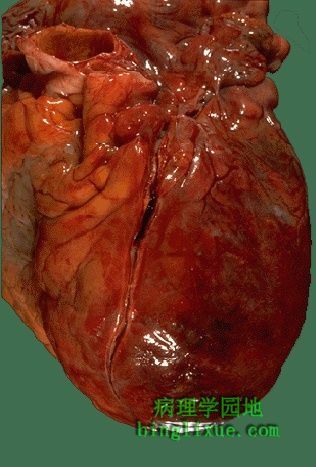 The anterior surface of the heart demonstrates an opened left anterior descending coronary artery.Within the lumen of the coronary can be seen a dark red recent coronary thrombosis. The dull red color to the myocardium as seen below the glistening epicardium to the lower right of the thrombus is consistent with underlying myocardial infarction. At high magnification, the dark red thrombus is apparent in the lumen of the coronary. 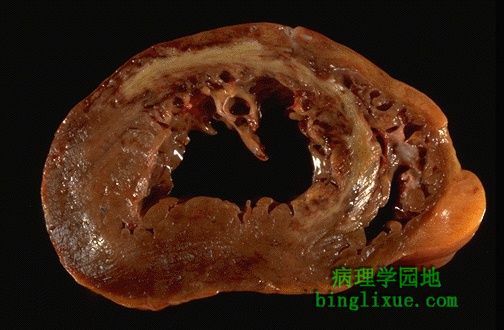 The yellow tan plaques of atheroma narrow this coronary significantly, and the thrombus occludes it completely. A thrombosis of a coronary artery is shown here in cross section. This acute thrombosis diminishes blood flow and leads to ischemia and/or infarction, marked clinically by the sudden onset of chest pain. This is the left ventricular wall which has been sectioned lengthwise to reveal a large recent myocardial infarction. 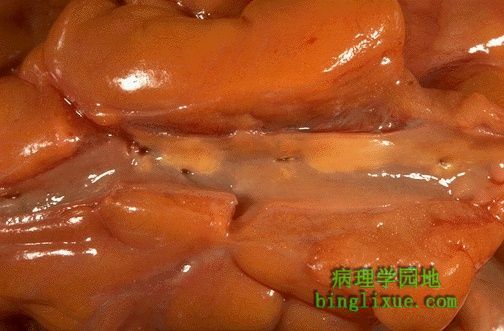 The center of the infarct contains necrotic muscle that appears yellow-tan. Surrounding this is a zone of red hyperemia. 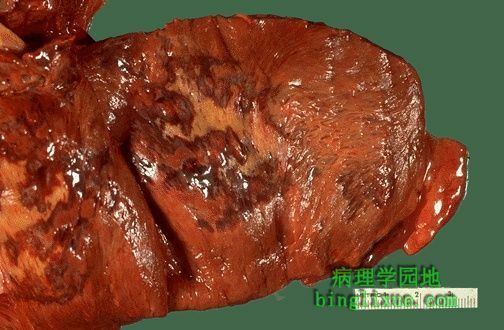 Remaining viable myocardium is reddish- brown. This cross section through the heart demonstrates the left ventricle on the left. Extending from the anterior portion and into the septum is a large recent myocardial infarction. The center is tan with surrounding hyperemia. 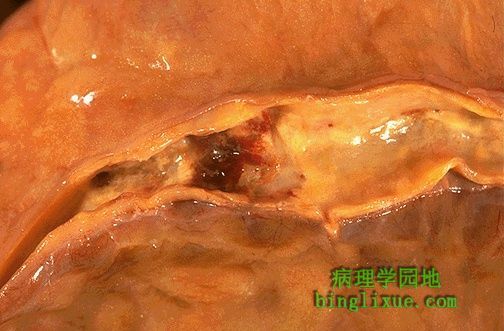 The infarction is "transmural" in that it extends through the full thickness of the wall. The earliest change histologically seen with acute myocardial infarction in the first day is contraction band necrosis. 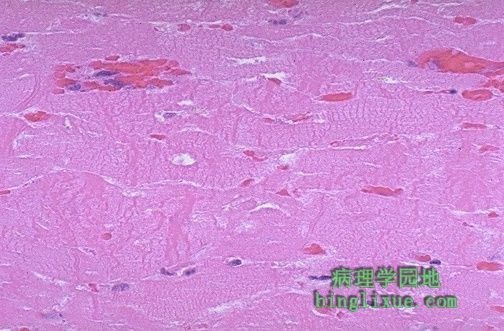 The myocardial fibers are beginning to lose cross striations and the nuclei are not clearly visible in most of the cells seen here. Note the many irregular darker pink wavy contraction bands extending across the fibers.